Alec Soth starts an interesting discussion with his The art of speculation on his Little Brown Mushroom blog, where he begins by quoting a series of Tweets by Erroll Morris which attempt to give a simple account of the principles of his new book Believing Is Seeing. Couldnt you argue that every photograph is posed because every photograph excludes something? In every photograph something is absent. Someone has made a decision about what time-slice to expose on the emulsion, what space-slice to expose on the emulsion. You can only argue this if you are prepared to alter the accepted definition of ‘posed’ to mean something intrinsically different to its normally understood and accepted meaning, of something that has been set up or re-ordered or arranged within the view of the camera. Framing isn’t posing, nor is the selection of the moment, or indeed the other decisions we all make that affect the picture we produce. His is not just a silly and circular argument, but one that erodes our critical vocabulary. 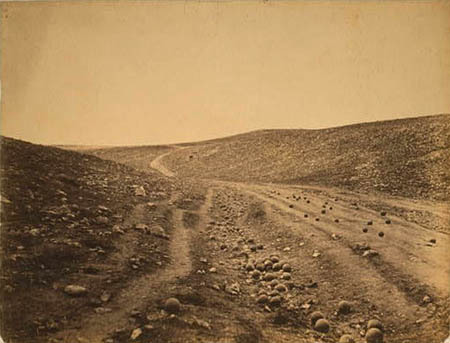 The quotation comes from the third and final of his three articles on these two pictures, where his quest to establish without doubt the order in which the two pictures were made takes him both to numerous experts in photo history and interpretation of images as well as on a field trip to the Crimea. You can read his full three part series on line starting at Which Came First, the Chicken or the Egg? (Part One) which has links to parts 2 and 3. It was certainly a painstaking exercise, but after I’d spent a couple of minutes reading a little of part 1, all I wanted to know was if he had established the answer – and whether it agreed with my own immediate photographic intuition on first viewing the image that the cannonballs on the path were perhaps rather too nicely scattered. I posted some thoughts on the matter here in Cannon Balls to Fenton when these articles by Morris were first published in 2007. Morris’s argument – as I say above – seems to me to be saying that if we redefine ‘posed’ to mean made using the kind of selection and abstraction that is always involved in making a photograph (even those ones that, to quote Leon Neal, you only got “you only got … by accidentally dropping your camera as your ate your Big Mac, firing a frame of the subject … as they passed behind you“) then all photographs are posed. I object to this kind of abuse of language. Let’s find the right word and use it rather than cheapen another that has a normally accepted different and useful meaning. 2. The intentions of the photographer are not recorded in a photographic image. (You can imagine what they are, but its pure speculation). It seems a rather partial truth. Soth makes the point that our speculations about the photographers intention are essential to our experience of the work, andI think it we can also say that the photographers intentions are also integral to the production of the work. Soth discusses a well-known image by Robert Frank, of the view from a hotel window in Butte Montana. Although Frank’s intentions may not be recorded in it, had they been different then he would have made a different picture. Or no picture at all. Frank’s intentions of course made him take not just this picture, but a large number of others, and to edit and sequence them in a particular way. And though his intentions may not be recorded precisely in the book or any individual image, both rule out many possible interpretations. What we imagine when we read the work is certainly not “pure speculation” but an impure speculation that runs with rather than against the evidence provided. Of course each of us sees a different picture when we look at this (or any other image) constructing it from our own interpretation of what we see and what we know about it, our previous experiences and the environment in which we come across it. We see a different picture every time we look at it, but we are likely to have both in our individual and our shared experience certain perceptions about it which are likely to be in common. Photography isn’t just a medium, it is also a community. This entry was posted on Tuesday, October 4th, 2011 at 10:41 am and is filed under Photo History, Photo Issues, Reviews etc. You can follow any responses to this entry through the RSS 2.0 feed. You can leave a response, or trackback from your own site.